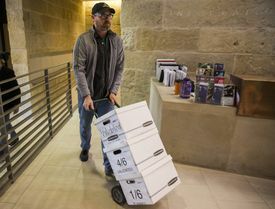 Mark Nathan delivers petitions to city clerk’s office on Jan. 17. In the standoff between the city of Austin and ride-hailing companies Lyft and Uber, the momentum clearly has shifted to those companies because of the City Council’s refusal to compromise — but also because Lyft and Uber so far are winning the messaging war. Posted in Mobility, Press Clips, Public Safety on January 27, 2016 by Comms.